This wine is expressing a host of red fruit such as cherry, strawberry, raspberry and cranberry. After the red fruit salad there are some nice apple and currant notes along with a noticeable creamy vanilla twist (think vanilla bean icecream). After the creamy vanilla there is a hint of cocoa and spice to round out the mouthfeel. The tannins are oft and approachable yet do carry some weight. The oak is subtle and well integrated into the body of the wine. The finish is bright and fruit forward with a touch of spice. 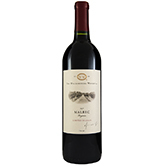 The Malbec was fermented in neutral French oak barrels for 10 days with IONYS Yeast. Village Winery Vineyards Petit verdot was cold soaked for 3 days then fermented in stainless steel with Alchemy III Yeast. Amrghein Petit verdot was cold soaked for 4 days and fermented in stainless steel with VRB Yeast and Lazy days Petit verdot was cold soaked for 7 days and fermented in ½ ton macro bins with FERM A33 Yeast.